British Gas shareholders gathered at the Queen Elizabeth II Conference centre in Westminster on May 12th for the Centrica AGM. 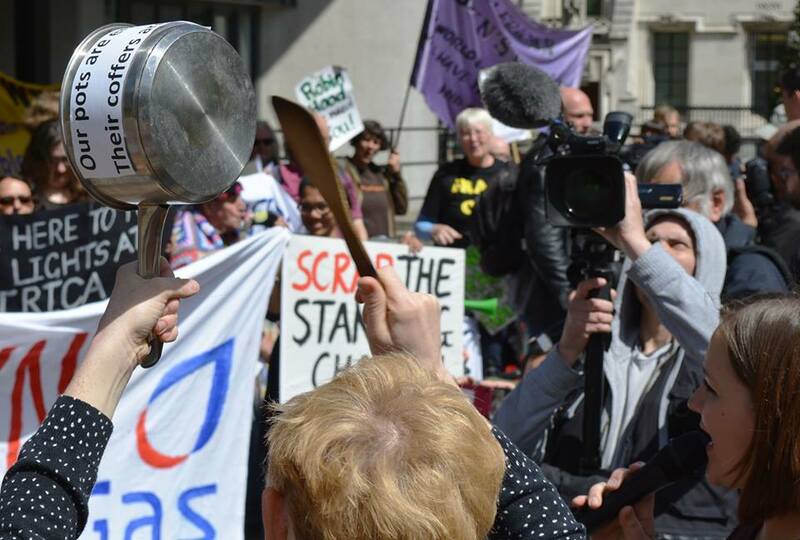 So too did dozens of us- in fact over 20 anti-austerity, anti-privitisation and environmental groups came out for our ‘Bin British Gas: Put Power in Public Hands!’ protest. Alongside us were groups including Lambeth Pensioners’ Action Group, Single Mothers’ Self Defense, World Development Movement, Disabled People against Cuts, anti-fracking groups and many others as we challenged energy giants British Gas, who make their profits from pushing households into poverty and polluting our climate. Whilst we demonstrated outside, making a racket as shareholders lined up to go into the conference centre, members of Fuel Poverty Action, Frack Free Fylde, Campaign against Climate Change, Zaccheus 2K, BP or not BP and Demand Energy Equality went inside to address the shareholders and Centrica management directly. We were lucky that the sun shone outside, giving the energy a real action! We banged our pots and pans and there was a storming Speak Out with speakers including Arian from Winvisible (Women with Visible and Invisible Disabilities), Tim for youth organisation Logical Change, Ellen from Lambeth Pensioners’ Action Group, Paula and Andy from Disabled People against Cuts, Terry from the Greater London Pensioners’ Association, Sian from Single Mothers’ Self Defense, Ruth from Fuel Poverty Action. We also heard from supporting organisations, including the World Development Movement and Green Party leader Natalie Bennett also came along to speak and listen. Inside, group representatives posed difficult questions to the British Gas board- questions were asked about poverty, prepayment meters, disconnections, green levies, fracking…and one of our lot decided to stand up and do something else entirely by reciting an adapted version of Shakepeare: ‘To heat or to eat, that is the question’ at the beginning of the meeting. Outside the day ended with a British Gas bill rip up (lots of fun), the handing round of British Gas bills that had been made into mini-wind turbines and the unveiling of the Fuel Poverty Action Energy Bill of Rights. Find out more through the photos and films below! We banged our pots and pans! Celebrations as British Gas bills are torn up! We also unveiled our Energy Bill of Rights- more info on this coming soon!